We only have two fruit trees in our garden. We have had both of them for going on four years now. Neither I nor my wife would consider ourselves horticultural experts. Indeed about the only things I know about looking after fruit trees I learnt from reading passages in the bible. Particularly John 15. 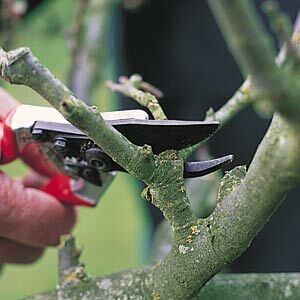 So inspired by John 15 I took my secateurs (just like in the picture) and set to. I first went looking for fruit. One of our trees is a pear tree and it has never borne us any fruit. I don’t blame it really, it was supposed to be pruned and trained along the wall. Nevertheless this year it is showing some signs of fruit on one branch. Maybe I was wrong but I didn’t have the heart to prune it much since it seems quite weak. I thought it might find the shock of severe pruning too much and die on me. But I did get rid of some new growth. The other tree is some kind of edible cherry – a damson but yellow. It produced its first small crop a couple of years ago and last year it produced a much bigger crop. This year it is looking promising, plenty of signs of fruit on many of the branches. So I thought – strong tree – fruit on many branches – I’ll remove the branches that are not bearing fruit and prune the ones that are a la John 15. The fruit is quite green at this stage and easy to miss among the green leaves so I was careful to make sure there was no fruit before I removed a branch. I noticed that if a bough was not fruitful (c.f. Genesis 49:22) then neither were any of the branches on it. If a bough was fruitful then several – though not all – of the branches on it had fruit. The tree was not large and neither were the boughs so I removed one particularly dead looking one and all its branches went with it – not one fruit on any of them. I also noticed a branch that had had fruit but the fruit had, even at this early stage, been eaten or removed by birds or something. I reluctantly removed that branch too. At this stage it is too late in the season to presume it will bear fruit again. When it came to pruning the fruitful branches I was quite thorough. I didn’t want the goodness of the tree to be wasted producing only leaves so I removed new unfruitful growths and twigs. I’ve been long enough around the Christian scene at this stage to have seen in churches the things I saw today pruning the fruit trees. If a stream or denomination is unfruitful all that it grows is ultimately unfruitful and will end up being removed from the life giving tree. It may lie dead on the ground for some time but eventually it is gathered by men into (building) piles and burnt. So often only the shell remains. I’ve also seen churches that were once fruitful but now no longer are. They can show you the remnants of the fruit but the destroyer was let in and they also are unfruitful. The work of the vinedresser can be sudden and traumatic. At the right time, when the fruit is showing itself, then what is happening in the tree can be seen and it is time for the Father to act. It isn’t easy when He does. I believe that this is such a time in Ireland.